Puls2™ is a revolutionary new heat sealing technology. With Puls2™, Fabric Welding has gotten easier and less complicated. Fabric welders with Puls2™ technology are transformed into a Smart Welder using the latest machine learning functionality. Most of our own clients using original pulse sealing have already upgraded to Puls2™. Predominant benefit of Puls2™ technology is the use of multiple small packets of heat required to weld industrial fabrics. These pulse packets are modulated to create a stronger and seamless sealing appearance. • ability to seal previously challenging materials such as PTFE Teflon, polyurethane, etc. • significant advantages for companies looking to automate their sealing/welding processes. As a result and to serve the greater good, Nova Products can upgrade non-Novaseal® branded Fabric Welders to include Puls2™ sealing technology. 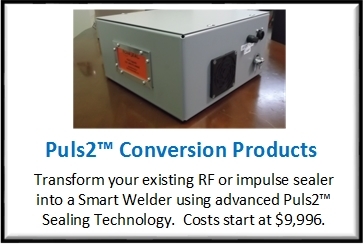 So, if you purchased another manufacturer’s impulse welder or RF/High Frequency welder and would like to convert their older sealing technologies to use the most revolutionary newer Puls2™ technology, contact us and we’ll provide you with a quote. Qualified non-Novaseal® competitive vendors with older sealing technologies shown on illustration.